Go on an adventure without leaving the living room. 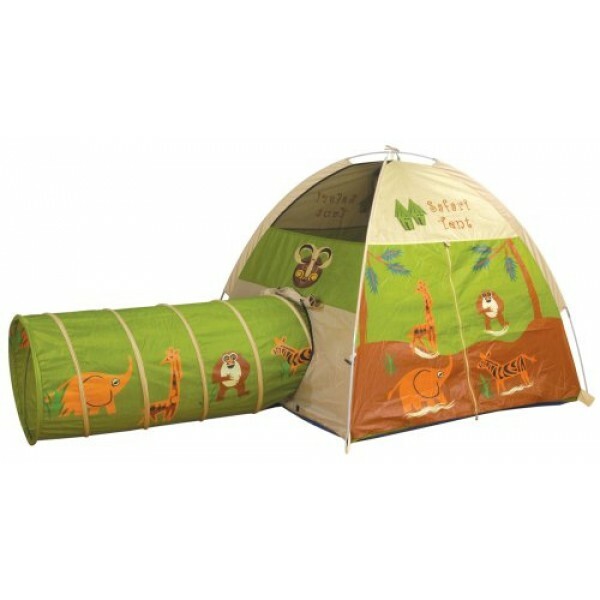 Pacific Play Tent's jungle safari tent and tunnel combo features a roomy tent and a colorful crawl tube, which together form a cozy play space for several explorers. Skylight windows provide excellent ventilation, and a waterproof floor cleans up with a damp cloth. The sturdy tent poles are shock corded for easy assembly. Shell is flame-retardant polyester. Tent dimensions: 44" high x 48" wide x 48" long. Tunnel: 48" long x 19" diameter. 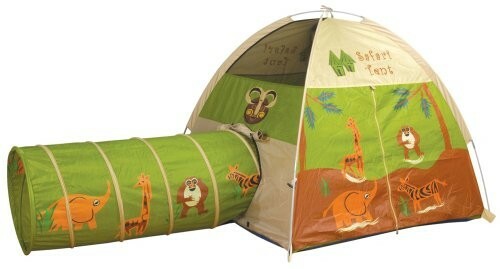 With a little help from an adult, kids can easily set up the 4-by-4-foot Safari Tent and Tunnel in minutes. The tent is easy to assemble with two durable shock-corded tent poles that are virtually unbreakable and fit easily into the pole pockets on the tent. After playtime, the tunnel folds down flat for storage and all parts can be put in the included storage bag.